Financed by the Ministry of European Integration and implemented by UNDP, the tournament began with preliminary games in Pejë/Peć, Mitrovicë/a and Prishtinë/Priština. On 9 May, in recognition of Europe Day, the winning teams met to face each other as well as four international European teams from Albania, Hungary, FYR of Macedonia and Slovakia. 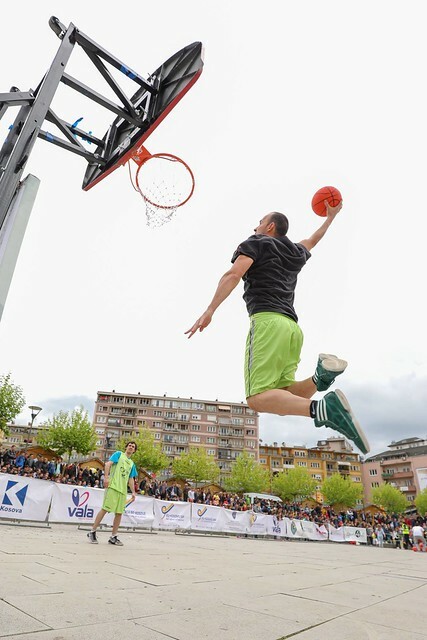 “The motto of the tournament this year is integration,” explained Bajçinovci, “trying to integrate young Kosovans into Europe through streetball.” “I think it is important that as the youngest Europeans we celebrate what Europe Day stands for,” he continued. Kosovo is Europe’s youngest nation with over 60% of its population under 25. The tournament garnered significant media attention, appearing in several national TV stations’ coverage. It is currently in its seventh year as a national tournament, and third year as an international tournament. The winning team from Prishtinë/Priština will represent Kosovo internationally in the upcoming International Street Ball Cup in Prague, Czech Republic this July.